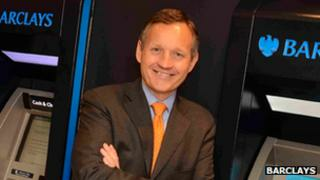 Barclays has appointed Antony Jenkins to be its new chief executive. The appointment follows the resignation of former chief executive Bob Diamond in the wake of the Libor interest rate-fixing scandal. Mr Jenkins currently runs Barclays Retail and Business Banking and has been a member of the group's executive committee since 2009. The announcement comes a day after Barclays said the Serious Fraud Office was investigating the bank. Barclays said the SFO was investigating payments between the bank and Qatar Holding LLC, part of sovereign wealth fund Qatar Investment Authority. The inquiry relates to events in 2008, when Barclays was raising money from Middle East investors during the banking crisis. In a statement, Mr Jenkins said he was "very proud to have been asked to lead Barclays", where he began his career nearly 30 years ago. The bank's fight to restore its reputation continues. But he admitted: "We have made serious mistakes in recent years and clearly failed to keep pace with our stakeholders' expectations." Mr Jenkins takes over at a difficult time for the banking group, which has seen its reputation severely dented. In June, it was fined £290m by UK and US regulators for manipulating Libor, an interbank lending rate which affects mortgages and loans. Mr Jenkins will start on a basic salary of £1.1m, with a potential annual bonus worth up to 250% of his salary subject to performance. On top of this, he may be eligible for a long-term incentive bonus worth a maximum of 400% of his salary. Barclays chairman Marcus Agius said Mr Jenkins was chosen "because of his excellent track record transforming Barclaycard and Retail and Business Banking". Mr Agius resigned as chairman following the Libor scandal, but agreed to stay on until a new chief executive was found. He will be replaced by Sir David Walker. The scandal also led to the resignations of the group's chief executive, Bob Diamond, and its chief operating officer, Jerry del Missier. Mr Jenkins was chief executive of Barclaycard from 2006 to 2009. Commenting on the appointment, Keith Bowman, equity analyst at Hargreaves Lansdown Stockbrokers, said: "The bank's fight to restore its reputation continues. "The chairman-elect has clearly given his stamp of approval, with the group appearing to signal a move back to its retail banking roots. "The former head of Barclaycard appears untarnished by the Libor scandal, and given his group experience, provides something of a running start."